The alarm went off at 6 a.m. and our Sunday officially began. One after another, we took showers and readied ourselves for our busy schedule. By 7 a.m. we were out the door and drove that familiar 12-mile stretch down the one single road from home that leads us to our usual Sunday destination. Were we on our way to church? Pfft. Don’t be silly; you guys should know me better than that. No, today was a Disneyland Sunday. Duh. So we got there early enough to park only a few spaces from the tram, got in at 8 a.m., split a cinnamon roll on Main Street for breakfast, and then made our way to our usual attractions. After the usual Jungle Cruise and Haunted Mansion stops, we headed to Pirates of the Caribbean which is another one of the family’s favorites. And that’s where I finally achieved personal photographic awesomeness. 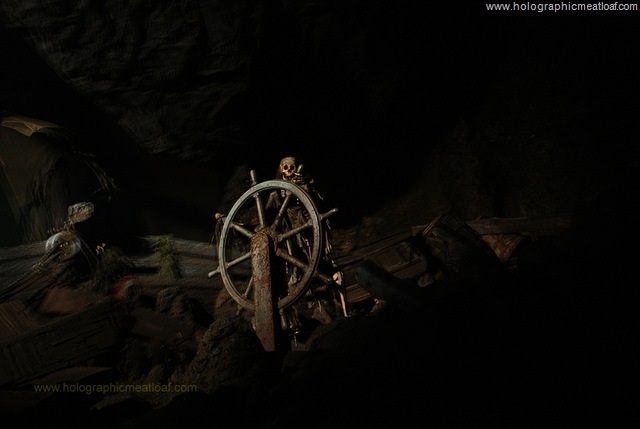 You see, for years and with various cameras of both the digital and film variety, I’ve been trying to get a shot of that damned skeleton at the helm of a ship inside the ride. You know, the one in the middle of a “rainstorm” with the “thunder” and “lightning”? Yeah, that one. But I didn’t want to use a flash for fear of looking like a dickish tourist blowing the illusion of the ride nor did I want to cheat and take multiple shots. This had to be a one-shot deal in which he was only illuminated by the strobe light. It’s in focus, it’s illuminated only by the strobe, and it’s my new desktop wallpaper. Sorry about the watermarks but hey, I’m damn proud of this and want some credit if peeps rip it off. Meh, I still have the hi-res version saved locally so I really shouldn’t care too much. But either way, I. Effing. RULE. With the way he loves his music, we always thought he’d be more inclined to play an instrument when he got older. But after seeing how much he loved shooting today and how serious he was, I think we need to reconsider. Just check out the phone-cam images of him within the set and you’ll see what I mean. Oh, and we finally got to ride Toy Story Mania after all this time and it was incredibly fun but not worth waiting over an hour as is usually the case. 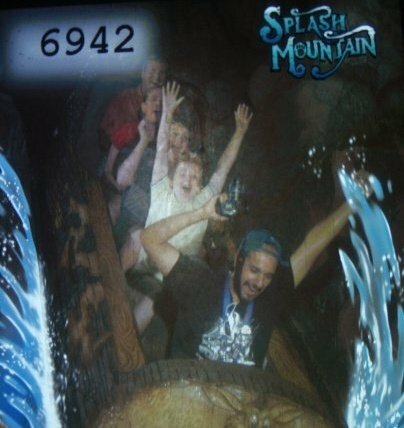 But we only waited 5 minutes because I guess it helps when your brother is working the ride. Shhh. Enjoy the pictures, and I hope you had a great weekend. It’s back to biking to work tomorrow now that my arm no longer feels like a rabid gorilla slugged me as a result of the tetanus shot I got last weekend.